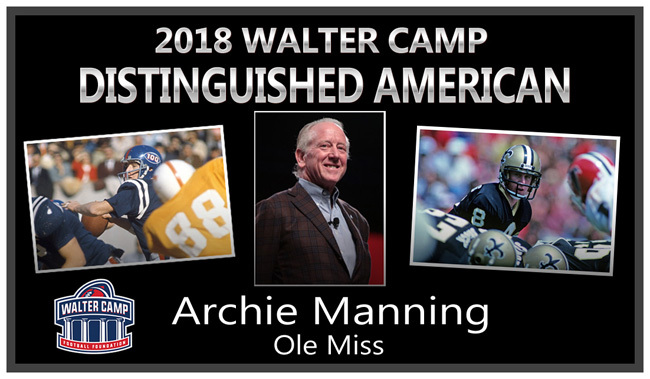 Former collegiate and professional standout Archie Manning (Ole Miss) is the 2018 recipient of the Walter Camp Football Foundation’s Distinguished American award. Manning will be honored at the organization’s National Awards Dinner on Saturday, Jan. 12, 2019. A native of Drew, Mississippi, Manning attended Ole Miss where he was the starting quarterback for three seasons. He was a two-time All-Southeastern Conference selection and finished third in the Heisman Trophy voting in 1970. He was the first Ole Miss player to have his number (18) retired. Manning was also an outstanding baseball player, having been drafted four times by major league teams. Manning was the second overall pick in the 1971 NFL Draft and played 10 seasons for the New Orleans Saints. He earned two Pro Bowl selections and was the NFC Player of the Year in 1978. He concluded his professional career with the Houston Oilers (1982-83) and Minnesota Vikings (1983-84). He passed for 23,911 yards and 125 touchdowns in his NFL career. Following his playing career, Manning has created a reputation as a leading humanitarian, assisting with a variety of causes, including cystic fibrosis, Special Olympics, Boy Scouts, and Salvation Army. Manning was inducted into the College Football Hall of Fame in 1989, and in 1993, he was named to the organization’s board of directors. In 2007, he accepted the role as chairman of the National Football Foundation and College Hall of Fame which is currently still holds. A current resident of New Orleans, Manning and his wife, Olivia have three sons, including Peyton (a 1998 Walter Camp All-American quarterback at Tennessee) and Eli (a two-time Second Team All-America quarterback at Ole Miss). In 2006, the National Father’s Day Council named Archie ‘Father of the Year,” and in honor of the Manning’s college football accomplishments, the Sugar Bowl has created the Manning Award which goes to the nation’s top college quarterback. Walter Camp, “The Father of American football,” first selected an All-America team in 1889. Camp – a former Yale University athlete and football coach – is also credited with developing play from scrimmage, set plays, the numerical assessment of goals and tries and the restriction of play to eleven men per side. The Walter Camp Football Foundation – a New Haven-based all-volunteer group – was founded in 1967. The organization’s mission is to perpetuate the ideals of Camp and to continue the tradition of selecting annually an All-America team and honoring deserving individuals.